It's pasta week on FBC! Granted, this is a self-declared pasta week but we wanted to celebrate pasta recipes from all over Canada. We've tried out wide noodle pasta dishes, skinny noodle recipes, gnocchi, crazy noodles of all shapes and today, we've got the ultimate in pasta comfort dishes: stuffed pastas and casseroles! If you've missed out on all our other pasta recipe roundups check out the links above and at the bottom of the post or visit our pasta recipe board on Pinterest. You'll have pasta recipes to see you through the year! 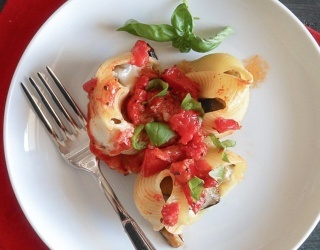 [Eggplant and Cheese Shells](http://anitalianinmykitchen.com/eggplant-cheese-shells/) from Rosemary at **An Italian In My Kitchen**. [Ravioli a la Greve](http://bethdunham.ca/updatesnews/2014/1/12/ravioli-a-la-greve) from Beth at **Beth Dunham Photography**. [Orecchiettes au Kefta](http://laportedegauche.ca/orecchiettes-au-kefta/) from Jeff at **La Porte de Gauche**. [Spaghetti Pie Casserole](http://myegglessworld.com/2016/01/08/spaghetti-pie-casserole/) from Jacquelynn at **My Eggless World**. [Lasagne with Turkey Bolognese](http://oracibo.com/recipe/lasagne-turkey-bolognese/) from Phyllis at **Oracibo**. [Meatzza Casserole ](http://www.simplystacie.net/2016/02/meatzza-casserole/)Casserole from Stacie at **Simply Stacie**. [Lasagne for One](http://www.melissahartfiel.com/2015/11/19/simplicity-lasagna-for-one/) from Melissa at **Eyes Bigger Than My Stomach**. Thank you to all our FBC Members who shared recipes for pasta week! FBC Pasta Week: 8 Shapely Noodle Recipes – Ooo La La!